I’m going to try to be brief tonight. It’s gone midnight and I have an early start. It’s my birthday – that’s my excuse – and I’ve enjoyed a night out at the movies. We saw ‘Lincoln’ (no, not the one where he’s a vampire-slayer, the other one). It was a powerful movie and makes me think that Lincoln may have been a better man than I had envisaged (which isn’t saying very much if you read some of my papers on him). Even so, Daniel Day-Lewis certainly portrays Lincoln as an admirable man. I’m afraid I’ve had no news on the trip to Syria – when it’s happening, if it’s happening, etc. I’m still hoping to get there soon but it appears that our would-be hosts are still too concerned about our safety to give us the green light. So I can’t offer you any first-hand account of the Syrian situation but I can recommend this excellent documentary that is the work of Anastasia Popova of Russian TV station, Rossiya 24. It is a documentary that promises no politics, but only people telling their story. It’s entitled “The Syrian Diary“. 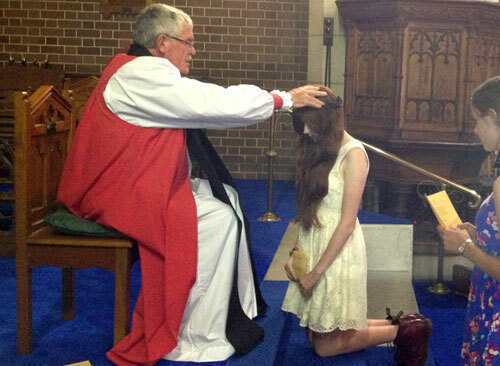 The positive side of not being in Syria was that I had plenty of time to prepare for our Confirmation Service on Sunday, which I had intended to get back for anyway, as my dear daughter, Imogen, was confirmed at the service. It was great to have Bishop Rob Rob with us yesterday and it was a great day for our community and all the families involved. Later the same day I had the joy of having a birthday dinner with the whole family. 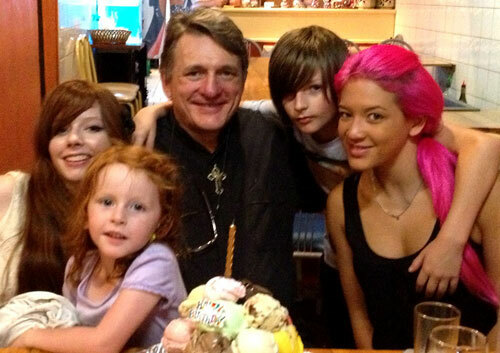 We went to one of those wonderful Japanese restaurants where they throw food at you, though as you’ll see from the pic below, my wonderful children and I survived the experienced relatively unstained! I must also show off to you the wonderful birthday present I received from my beloved daughter, Imogen (yes, the same one who was confirmed). These paintings are Imogen’s own work and they make me very proud. I know I’d be proud of her whatever she came up with but I do think she has a wonderful gift, and we’ve set up a website for her where she can start to display her work – www.imogensmith.me. Whosoever Divorces and Marries another Commits Adultery! I was going to finish off today’s missive with the sermon from Bishop Rob. Unfortunately it appears that we haven’t been able to get it uploaded yet! This is an offensive statement to a person like me who has been divorced and remarried! And the worst part is that it come straight from the lips of Jesus Himself (in Mark 10:2-16)! What do you do with a deadly condemnation like this? Well … my answer is below. And if you can’t see the video, click here. I said I’d try to be brief, so it’s definitely time for me to wind things up. I have been well and truly blessed on my birthday this year, but if you’d like to buy me a drink you are more than welcome to. Alternatively, if you really want to give me a present that will bless us all, take out a membership at www.fighting-fathers.com. I’ll see you again next week if not before.